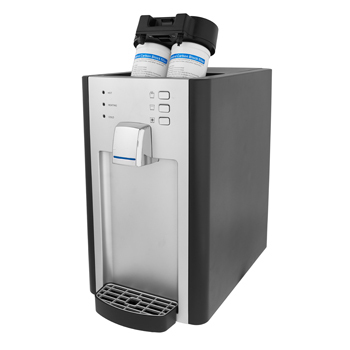 FW-PRO Bottleless CounterTop Water Cooler - introduced in 2015, an Award WinningBottle-less Water Purifier with 2-stage Regular or 3-stage Reverse Osmosis filtration system for you to choose from. 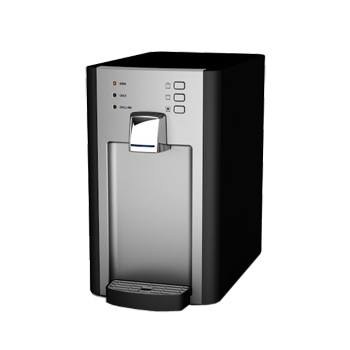 This machine can serve you hot, cold & room temperature filtered water conveniently throughout the day. Feeling fizzy? Order this with the optional sparkling/soda water feature! 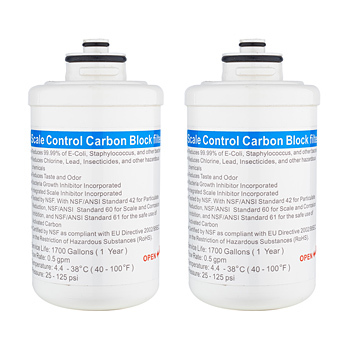 The FW-PRO has a built-in 2 stage dual 1 micron Carbon Block/Anti-scale filter system with a bacteria inhibitor that blocks 99.9% of e.coli; reduces chlorine, lead, insecticides, removes bad tastes and odors and also prevents scale build-up. 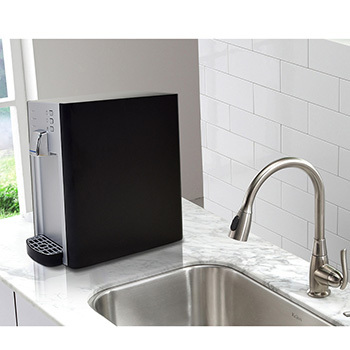 The RO system is an external installation that can be placed under a kitchen sink or inside a cabinet. These filters remove most common contaminants found in city tap water and produce crystal clear, fresh and tasty water - no bottles to buy! Sleek and elegantly designed, this product will stand-out in your kitchen or even in your office. 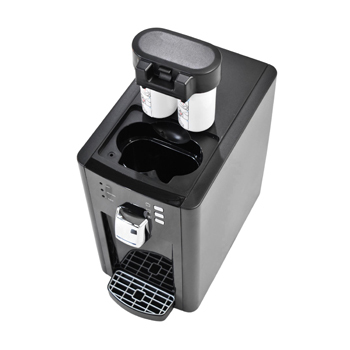 At 15.25" tall, the FW-PRO can fit on any standard counter occupying only a minimal area on a table top. 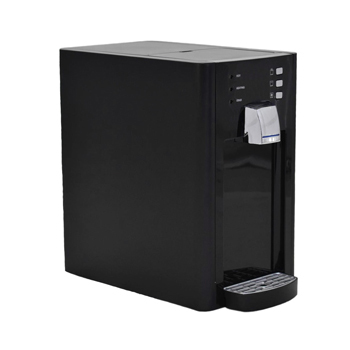 High end components that produce legendary quality, reliability and easy serviceability makes this cooler a top of the list for counter filtered cooler buyers. Choice of Carbon Filtration or Reverse Osmosis. Tabletop Purified Hot, Cold and Ambient Water at a touch of a button. Simple and easy to use LED Control Panel. 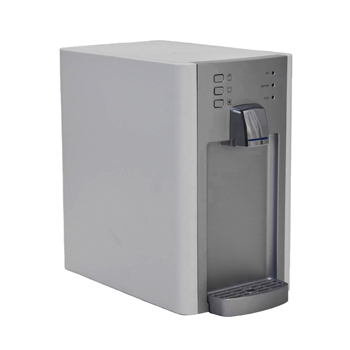 Connects easily to cold water line for unlimited filtered drinking water. Surgical high grade type 304 Stainless Steel hot, cold and ambient water temperature tanks. Also available in a Sparkling Water* configuration! * Sparkling Water configuration does NOT include CO2 tank or regulator. Sparkling Water is sold on the market for $1200 , order exclusively from FilterWater.com at deep discount under $1000 (sparkling is additional $500, call us for exact pricing). Best in class 1 year manufacturer's warranty system on electronics, 3 years on compressor. 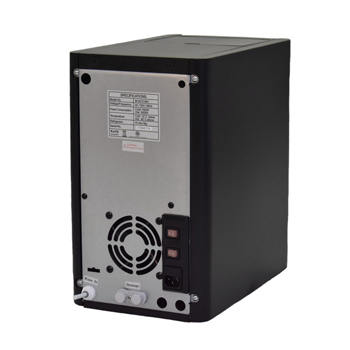 - All Units come with a complete filtration system, ready to be installed. - Filter cartridges are included with FW-PRO coolers that come with filtration system installed (FW-PRO-F, FW-PRO-RO). - Final assembly in U.S. using U.S. and overseas parts.